Act fast...save $100 off exhibiting in Orlando if you reserve space by May 15! Perhaps you have a book, jewelry or other product you'd like to sell to your fellow therapeutic horsemanship professionals. Maybe you have educational offerings to advertise to PATH Intl. members. Are you a CPA or lawyer and could provide behind-the-scenes knowledge to other PATH Intl. members? If so, plan to exhibit at the 2013 PATH Intl. 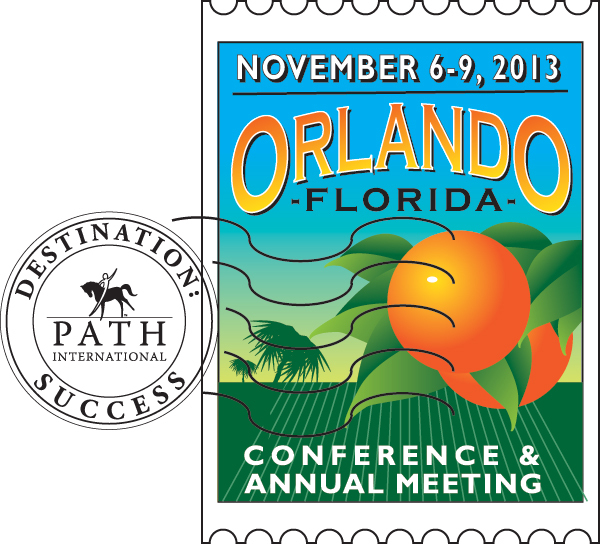 Conference and Annual Meeting November 6-9, 2013, in Orlando, FL! All PATH Intl. members get a $50 discount on exhibiting anytime. With Mother's Day and graduation season coming up, honor a loved on the PATH Intl. website. Click here to learn more. It only takes $25 to show your love this May! PATH Intl. is seeking Membership Oversight Committee Region Representative nominations. The PATH Intl. annual nomination process for region representatives is underway. This year nominations are being accepted for odd-numbered regions: 1, 3, 5, 7, 9 and 11. PATH Intl. Region Representatives serve as ambassadors for the association and as the voice of their region's members. Responsibilities may include recruiting, retaining and recognizing members; collaborating with groups within and outside of PATH Intl. that can positively impact the success of PATH Intl. members; leading PATH Intl. recognition of center and individual members and participants; and helping coordinate states, regions and PATH Intl. communities into effective networking systems. Check out this member benefit! CertifiedBackground.com is now a corporate member of PATH Intl. and is offering a 20% discount on its services to PATH Intl. Centers. CertifiedBackground.com is a brand of Castle Branch, Inc., the tenth largest credential management and background screening company in the United States. Castle Branch and its various brands provide credential management, background screening, drug testing, employment verification, immunization tracking, certified records review, document management and related services to its clients. Additional information is available at CertifiedBackground.com. CertifiedBackground.com is offering a series of free webinars every Wednesday at 1 p.m. EST through the month of May for interested members to learn about its easy-to-use process. Through these sessions, member centers will see the wide range of services that can be tailored to meet their unique needs. All centers need to do is email Mike Kenney to arrange which session to attend. PATH Intl. sponsor Bimeda/Equimax has a Volunteer of the Month program that can benefit your center. Click here to check it out and get a chance to win prizes! Compass, an organization that provides pro bono consulting services to nonprofits whose work benefits the Greater Washington, D.C., community, is conducting a survey of centers offering equine-assisted activities and therapies (EAAT) throughout the United States. The data collected will better help an anonymous client to provide best practices that can be shared throughout the EAAT community. Through your participation, we eventually hope to understand the successful practices of these organizations. The questionnaire will require approximately 15 minutes to complete. All information collected will remain confidential and will only be provided in the aggregate. Providing your name or your organization's name is purely optional. All participants in this survey, who choose to provide contact information, will receive a copy of the aggregate results once they are completed. The more participation in this survey, the better the overall data will be for all participants. Center Directors, please take a few minutes to complete this questionnaire, or to forward it to someone in your organization to complete. Without the help of people like you, this type of research could not be conducted. If you have any questions or concerns about completing the questionnaire or about participating in this study, please contact Michael Childers, Compass Project Leader. Thank you for participating in this worthwhile undertaking. Click here to participate in the survey. Many of you will remember a story in PATH Intl. eNews and posted on our Facebook page from early December 2012 regarding the Pentagon's decision not to cover hippotherapy for Kaitlyn N. Samuels, the daughter of a Texas Navy Captain. At that time and since, PATH Intl. has sent support materials and letters of endorsement to Rep. Tom Cotton (R-AR), Senator Michael C. Burgess (R-TX) and the Samuels family. Thank you to all PATH Intl. members who chose to share their views with the representatives in their home states and Texas. Upon hearing about this story, a generous donor offered to fund Kaitlyn's EAAT for one year. In turn the Samuels family demonstrated their depth of integrity by asking the donor to contribute not solely for Kaitlyn's hippotherapy but also for two other military families whose children benefit from EAAT at PATH Intl. Premier Accredited Center Rocky Top Therapy Center in Keller, Texas. Flash forward to 2013. On Wednesday, April 24th, Rep. Michael Burgess introduced the Rehabilitative Therapy Parity for Military Beneficiaries Act (HR1705). The law is co-sponsored by Rep. Tom Cotton (R-AR). The law calls for Tricare (the health care program serving uniformed service members, retirees and their families worldwide) to cover "therapies provided on a horse, balance board, ball, bolster and bench" if these therapeutic exercises or activities are included in the individual's plan of care. Congratulations to all involved in making this advancement a reality. Compliments to American Physical Therapy Association (APTA) for helping to develop the bill's language and to American Hippotherapy Association (AHA) for actively promoting awareness of the bill and supporting the education of their members, their patients both current and future, and others interested in helping support and grow the field of EAAT, specifically hippotherapy. Watch for developments of and status updates on this bill in future issues of PATH Intl. eNews. Want to make your opinion heard? Click here to find your State Representatives and Senators. Network with your fellow region members and connect with your Region Representative on PATH Intl. Community Connections. Join your region community to share local resources with your neighbors. With the rapid and continuing growth of equine-facilitated psychotherapy and learning in the EAAT field, it's only natural that mentions of it would find their way in to popular culture. Recently, there have been three examples. The first was on an episode of "Fashion Police," the Joan Rivers et al. celebrity fashion-bashing show on E! teaching bedside manner and communication to first-year med students. Dr. Hamilton believes that his classes at the stable can build better doctors, helping them to overcome fear and improve confidence. Click here to read the story and watch the clip. The more accepted EAAT becomes by the public, the more stories (and storylines) like these will pop up in mainstream culture. If you have an example, share it with us or post it on our Facebook page.